Saturday after Thanksgiving 2017, we left Texas for two total opposite trips in one vacation. We spent four relaxing nights next to the ocean, followed by eight nights in the beautiful culture of Oaxaca City. If you're traveling to either of these places, you might find some helpful tips we learned from this trip below. Between the sparkling Caribbean sea and the evergrowing tropical jungle, Tulum claims to be an eco friendly focused destination sans commercial anything. Clear your mind in a hammock, indulge in its wonderful culinary experience, swim in a cave or join the large yoga community. Tulum has a variety of things to offer. Our reason for visiting was Lisa's 30th birthday. ADO BUS We flew into Cancun and took the ADO Bus to Tulum. Purchase tickets at their stand just outside the airport and the buses arrive every 30 minutes. It's about a 2 hour bus trip, making two stops along the way. ADO charter buses are new/clean, air conditioned and cost about $8USD/person one way compared to taxis/shuttles costing $50-250USD. Passengers are dropped off at the ADO station in the town of Tulum. Finally, take a 10-15 minute taxi ride to hotel. Taxis are all over Tulum. Ask how much before you get into the car, as some will try to rip you off. Cuánto cuesta means how much in spanish. We said this often. Because of taxis and bike rentals, we found renting a car was not necessary. HARTWOOD was all the hype in Tulum. If you want to dine here, you need to make a reservation in advance on their website which we did and yes it was worth it, but it wasn't the best food we had there. 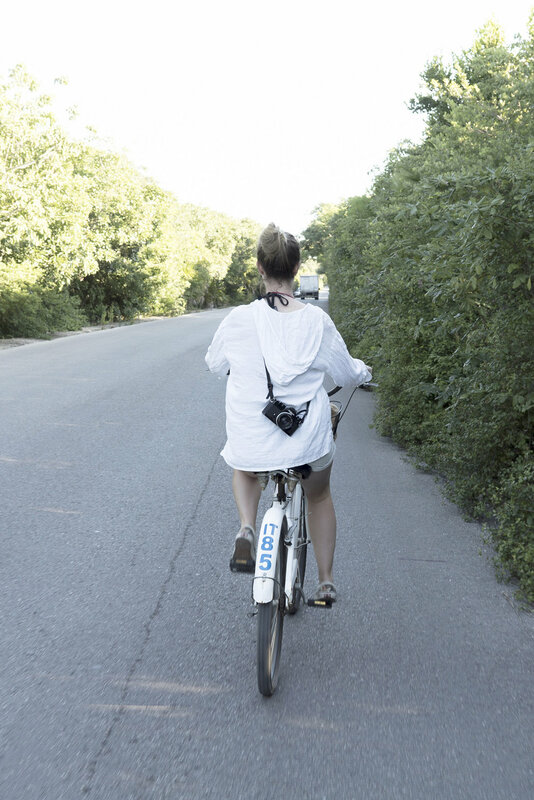 BEJUCO is the best everything we had in Tulum. You can eat in a somehow very comfortable candlelit wooden teepee literally on top of the ocean under the stars. If the ambiance isn't magical enough, the food is in-cred-i-ble. Pretty sure every employee came to greet us, even the chefs from all over the world. It's evident they truly care about every dish. Favorites: ginger couscous, pasta, lemon tart. We luckily found this place because it was across the beach cove from our hotel. They were doing a soft open while finishing renovations. EL GOURMET is in the town. Delicious, very fresh sandwiches and juices. Great lunch spot while biking or before catching the ADO bus. KIBOK COFFEE is also in the town, just down the block from El Gourmet. Great coffee, good people watching spot. Other restaurants to check out: Gitano, Posada Margherita, Gitano, The Real Coconut, Raw Love, Kitchen Table. MARIA DEL MAR is where we stayed and would highly recommend it for anyone looking for a quiet, private, carefully designed hotel. Our room was massive with a balcony and private rooftop area viewing both the ocean and jungle. Yoga on the beach balcony is a must as well as their spa services. Breakfast was included, but you have to ask for it. CASA MALCA Like Hartwood, Casa Malca is pretty hyped and had mixed reviews so we checked it out mainly because it used to be Pablo Escobar's hideout mansion. It's at the most southern part of Tulum's hotels on the ocean and there's just a guard at the gate, no sign. Wedding dresses drape the entrance framing vintage furniture floating by chains. Walk up the spiral staircase to the right for rooftop views of the ocean and jungle, or go straight to the hammocks in the sand. Art is everywhere in this place. Good lunch here: we got fish tacos, agave lager and passionfruit mojitos. BE TULUM After checking out Casa Malca, we walked north and started hotel hopping. This hotel was one that really stood out from the rest. AZULIK is a magical place, especially for sunset cocktails. Their bar area includes private 'nests' that overlook the jungle. Ladies, do not wear heels here. RUINS OF TULUM is a National Park at the north side of Tulum. We rented bikes from our hotel and arrived when they opened at 8AM to avoid crowds. Entrance is $2USD/person. You can take a tour, but we explored the grounds on our own and quickly found the beach. Take the steep stairs down to the sand and swim through the rocks in the most beautiful clear water. GRAN CENOTE There are several cenotes to check out in the area. Entrance fee is $5USD/person plus rental fee for goggles. Take your own goggles if you're not into that - but seeing what's under the water is the experience. We arrived before midnight after a layover in Mexico City. Taxiing to our hotel at night, we picked up pre-millennial Bushwick vibes. Close to the center of Oaxaca, we checked in at Hotel Casa de la Tia Tere for 6 nights. We both would recommend this hotel to anyone looking for an authentic experience with all the amenities. Nothing too fancy, but everything you need for a pretty fair price for Mexico. Waking up the next morning, we went downstairs where the hotel served us a personal breakfast of eggs with tomato and onion, fresh fruit, and bread. We walked out the door with little plans but to explore the foreign city. Halfway down the block, Lisa stopped about a dozen times filling up her roll of film of bright worn colors and beat up makeshift cars. In contrast to our Tulum portion of this trip, we arrived to Oaxaca with no structured plans. Our 2nd day in town ended with meeting a shop owner named Sophia who took the time to write down recommendations on a piece of paper (front and back) which we will share down below. Many of her suggestions matched with our friend Mike, who we met from painting at a Lululemon store in Toronto. Over the week, we took taxis to nearby towns to places like St. Augustine, Hierve El Agua, Monte Alban Ruins and the textile city of Teotitlan del Valle. For our last two nights in Oaxaca City, we checked ourselves in at the most luxurious historical hotel Quinta Real for the grand finale of vacation. This hotel dates back to the 16th Century with gorgeous gardens and high ceiling rooms. 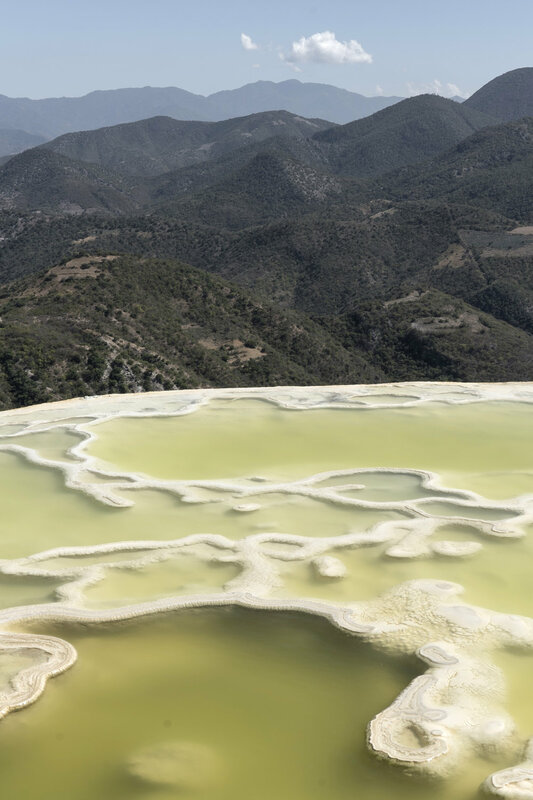 For us, it felt a bit extreme to stay there since just outside in Oaxaca was a completely different story, but it was truly magical place to end the trip. CAFE BRUJULA we returned for coffee here to read and journal back in their gorgeous courtyard. FONDA ROSITA inside Mercado de la Merced serves the best breakfast chilaquiles for $2.50USD. BOULENC We returned to this place for breakfast twice. The bakers are from Germany and make fresh bread and pastries every day. Favorites include english muffin, avocado toast (not your ordinary), croissant sandwich and pastries taken to the airport. Everything was mouthwatering delicious and their dishware is beautiful! LA BIZNAGA is a pretty good lunch spot. Loved the hibiscus drink. Located in a courtyard surround by good shops. EL DESTILADO Great place for happy hour and a light dinner. One of the bartenders was from Seattle. CRIOLLO was our first Michelin star restaurant! A little further out from the center of town, but still walkable. We ordered the prefix menu which was a 7 course meal, so if you plan to go, go starving. The ambiance alone was magical. LOS DANZANTES We went here for a quiet, cozy dinner. ORIGEN English friendly menus, nice dinner. We got the pasta negra. CASA OAXACA Most people say this place is an absolute must when in Oaxaca. Sit upstairs on the rooftop and overlook the mountains and city at sunset. We came here to celebrate our last night in Mexico. CENTRO DE ARTES DE SAN AGUSTIN is a half hour taxi ride from Oaxaca City and 100% worth the trip. Gorgeous setting in the countryside mountains in a small village, this place used to be a textile factory and is now an art school and exhibition with a paper factory. They were showing photographer Graciela Iturbide work while we visited. Take a red collectivo taxi (shared) back to town. In the colectivo we met a Chilean photographer who had been living in a Oaxaca Airbnb for $100USD. MONTE ALBAN RUINS was one of the stops on a full day tour we did. The tour included the ruins, visiting a village that paints alebrijes, another area that created the technique of Oaxaca black pottery at Dona Rosa and finally Santiago Apostol. Usually we're not into planned tours like this but - when in Mexico. We met a lot of wonderful people from all over the world in our little bus that took swampy dirt roads to get to these places. TEOTITLAN DEL VALLE is a small village specifically known for their textiles. We learned how to spool different fibers and how to make natural dyes. We ended up taking a bus back to town from here, luckily catching the last route of the day for .50USD. PALENQUE MAL DE AMOR We took a taxi out to this mezcaleria. No one else went early that day, so we got a private tour of how they take agave plants and turn it into mezcal. The 2nd generation owner showed us around and poured us all his versions of Mezcal from different types of agave plants. HIERVE EL AGUA was a big adventure. We took a taxi to Mitla, from there we got in a questionable truck with a cracked windshield that wound up a one lane/two way dirt road up a mountain. Somehow, we still felt safe. Dropped off at the top, you can take a 5 minute stroll to the beautiful bright natural pools that overflow the mountain cliff. We recommend going early to avoid the crowds that come quickly. There are vendors with cocofrio and other foods, but we recommend taking snacks since the heat and altitude can get to you quick. You can also hike down to the bottom of the 'waterfall' but we didn't make it there.